You can also take advantage of central UCL library training at LibrarySkills@UCL. Getting Started web pages cover basic information. LibrarySkills@UCL sessions are bookable workshops covering a range of library and information literacy skills. Online learning and guides allow self-directed learning on various topics and include 'Skills in Seconds' videos, which introduce print and online resources. You can also find more information on guides and elearning information here. To sign up for library sessions including Explore, search skills, evaluating information, referencing, Endnote and Mendeley, please contact libraryskills@ucl.ac.uk. To sign up for a range of sessions for UCL doctoral and postgraduate researchers, please contact doctoral-skills.ucl.ac.uk. Hands-on workshops and demonstration sessions in a wide range of applications and tools. Courses looking at: Endnote, WordPress for blogging, Twitter, XMnd, screencasting, iPad apps, Prezi, Evernote and OneNote (digital notebooks), Macintosh applications, Office 2013 applications and more. Sign up for UCL Institute of Education IT Training here. The training programme schedules, links to software guides and news of other training related issues are available from IT Training. For regular updates on computer training, join the 'Computer Training Updates and News' list by contacting the IT Training Analyst at ioe.ittraining@ucl.ac.uk. The IOE, UCL Libraries and Clarivate offer a range of Endnote support. 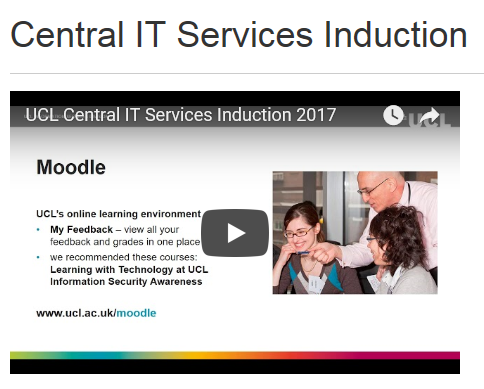 The Digitial Skills at IOE booking system is where you can sign up for Endnote sessions. UCL Libraries have a 16 page Introduction to Endnote X8 here and an IOE Endnote LibGuide. Clarivate offer free online training courses. You can register here for these. Linkedin Learning (including Lynda.com) provides online learning courses and videos for a range of needs including education. You are welcome to attend ISD's drop-in sessions where an IT trainer will be able to offer guidance and answer any specific queries you might have (e.g. Endnote). The drop-ins take place on Tuesdays (10am-12pm) and Wednesdays (2pm-4pm) in Room 223, Chadwick Building. No appointments are taken so you are encouraged to arrive early.